DUBAI (Zawya Dow Jones)–Dubai Police has arrested Kabir Mulchandani, chairman of Dubai property company Dynasty Zarooni Dubai-based Al Bayan newspaper reports Thursday, citing a senior police official. “Dubai Police has arrested Kabir Mulchandani for fraud and bouncing checks’ accusations, and he is currently under investigation,” Al Bayan cites Colonel Khalil Al Mansouri, head of criminal investigations unit at Dubai Police, as saying. “His case will be sent to the public prosecution soon to complete the investigation,” Al Bayan reports. Zawya Dow Jones first broke the news of Mulchandani’s arrest on Tuesday. The government has been investigating a handful of the city-state’s top real estate and lending firms, but Mulchandani’s arrest this week is not thought to be linked to these ongoing corporate investigations. Copyright (c) 2009 Dow Jones & Co.
Chairman Dynasty Zarooni arrested – Sources told Gulf News the complaints involve some Dh2.8 billion. Dubai: The chairman of a Dubai-based real estate firm has denied reports that he had been arrested on allegations of fraud. Kabir Mulchandani told Gulf News there was no police arrest warrant against him. “I know some complaints have been lodged with the police by some people against our firm but these people gave cheques that bounced. They have no legitimate reason to complain,” he explained over the phone. Company president Hilal Al Zarouni said the company is “functioning properly”. Both executives said they didn’t know if the police were investigating the complaints. Lawyer Salim Al Sha’ali, who represents a number of complainants, said the complaints are related to an alleged fraud scheme. “We have been studying the legalities of the case… and we believe that there is a supposed crime of conning people out of money,” he told Gulf News. The Federal Penal Code and the property laws issued lately are the legal grounds in this case, argued the lawyer. Sources told Gulf News the complaints involve some Dh2.8 billion. However, Mulchandani denied the accusations and said he has “all the documents that support our position that those people have reneged on their commitments”. © Gulf News 2009. All rights reserved. Posted in Dubai, Kabir Mulchandani | Comments Off on Chairman Dynasty Zarooni arrested – Sources told Gulf News the complaints involve some Dh2.8 billion. Dear Victims of Dynasty Zarooni with the launch od Ebony Ivory Tower Plot H3 and G3, Jumeirah Lake Towers,by Dynasty Zarooni. Your case with Al Fajer Properties start in March-April 2008, with you are saying false advertisements by Dynasty Zarooni and your purcahse in Units or Floors at Dynasty Zarooni Ebony / Ivory Towers Jumeirah Lake Towers Plot H3 – G3. It`s not a secret that you start with your complaints in June 2008, and not just now, after the so called financial crisis . The original documents we hold in hands is not a direct matter with Dynasty Zarooni but it can be seen in the simiular, because this matter is direct linked to long ongoing story around the Plots H3 and G3 in Jumeirah Lake Towers. The investors who are still in this disaster didn`t ever complaint at the police in Dubai, as ther is n sense to do so – the so called untouchable ” backing” in Dubai for the Developer seems to be a special ! WE think that you, at this time havent been aware, that Al Fajer Properties has promised and 100 %contractual agreed with DMCC the following to protect the rights of the Ivestors left from Nakheel Flamingo and Falcon Towers on this Plot H3 and G3 in Jumeirah Lake Towers. i.) Transfer to new developer……………. This developer DMCC found October 2006,confirmed in a letter from DMCC to an investor 22. October 2005, was Al Fajer Properties. As for second query, pertaining to the issuance of a contract by Al Fajer Properties for your apartment, we ask you to be in touch with Ms. Kati Sebour of Al Fajer Properties. Kind regards Ysamine Hussain, Customer Service DMCC. Until end of 2007, nobody from the Investors who have agreed to the transfer from Nakhee to Al Fajer Properties has been told that they are not willing to built the Towers as agreed , 100 % Residential Towers ! This was also the time Al Fajer starts to tell those investors a lot of stories – pushed them to sign a document which nobody would ever sign , because at least it had been null and void -with the only goal to kick them out – to have a free way – what was already in their mind. At least they start to act agressive in early 2008, also with the help of their lawyer Denton Wilde Sapte. To this actions of Al Fajer Properties RERA Dubai is informed since March 2008. The investor in this case was at this time not aware that Al Fajer Properties has already started to launch this Towers completly new under changed names : Ebony and Ivory Towers. 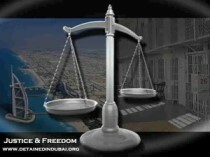 Fact is, that at the time Al Fajer Properties had still taken the agreement with Dynasty Zarooni for this both towers, and selling them complete to Dynasty Zarooni, that at this time the agreements of the former investors left from Nakheel on this Plots and 100 % confirmed by DMCC, have been still legal valid. Dynasty Zarooni gets clean chit. By the acknowledge of this and some deep invstigations to get evidence – for them it became clear – what was the real reason of the agressive acts – Al Fajer Properties forward to them Januar – March 2008. It`s very interesting to read in the Dubai Press, that Dynasty Zarooni`s Chairman, is calling the complaints of those Investors “Criminal Complaints” in the public.Statements like this are acts of discrimination under the header “Human Rights” and should be filed outside of Dubai. Poppy seeds in food, common over-the-counter medications and traces of banned substances are enough to warrant four-year prison sentences in the United Arab Emirates, travellers were warned today. Visitors to Dubai and Abu Dhabi are now being advised to “take extreme caution” and “avoid arrest for ‘possession’ of a controlled substance”. The advice, issued by the legal charity Fair Trials International, follows a recent spate of arrests and imprisonment. The charity, which assists those facing trial abroad, has urged travellers to ensure they are completely free of any substances prohibited by the country they are visiting. Earlier this week, a 43-year-old from Middlesex was imprisoned for four years after 0.003g cannabis was found in the tread of his shoe by customs officials in Dubai. Keith Andrew Brown was stopped in transit from Ethiopia to London last September. The amount of the drug found on his shoe would not be visible to the naked eye and weighs less than a single grain of sugar. We wrote about this, explaining the “doom and gloom” which, thanks to the current financial crisis, does exist in Dubai. So we were again surprised (and shocked), when we found a mail in our inbox from Dubai’s Damac Properties, announcing that “Property boom is back with a bang!” And why? Because the company claims it is offering waterfront offices in Business Bay at the launch price of 2007. Property buyers in Dubai are rapidly turning into sellers even as they struggle to find an interested investor. More than 1,000 people have been laid off in the real-estate sector, developers have cancelled projects, and property prices have fallen drastically. While property ads in the region have fallen – The National newspaper has just one property ad on Tuesday – a developer talking about a “property boom” or a “lack of gloom” in the current scenario does seem jarring. Rather than trying to pull in new investors, a better idea for developers might be to provide good customer support to the existing ones.